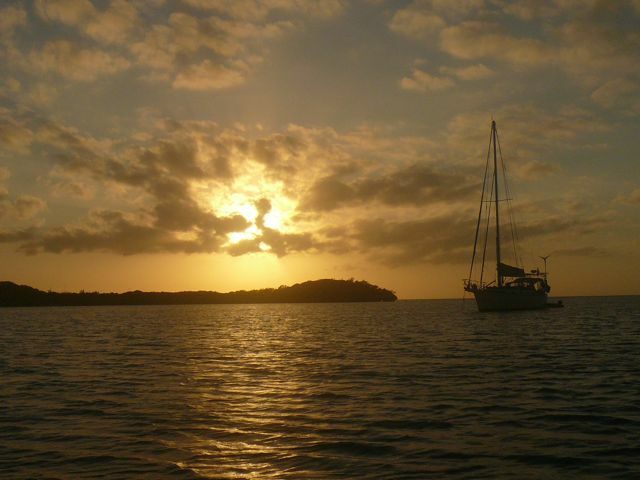 Today we sailed from Black Point and pulled in to Cave Cay Marina. 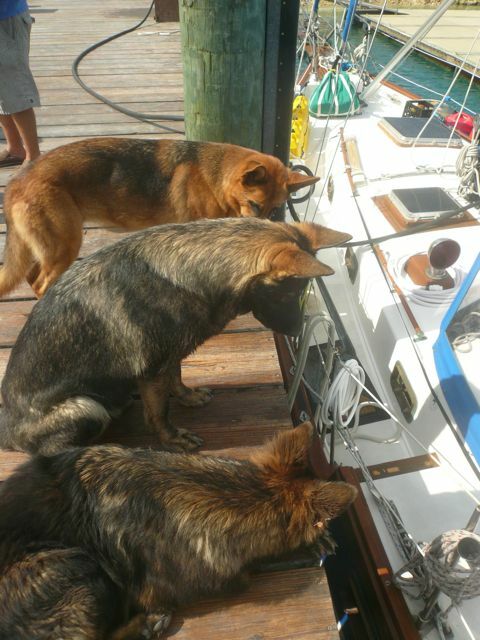 We were greeted by three huge German shepherds – Lobo, Pancho, and Bella. We put in for $2/ft on floating docks, with complimentary laundry and shower facilities, as well as access to a budding garden. It was a wonderfully deep and protected harbor. The floating dock was an amazing relief to us Lake Erie sailors, not used to the tides as we are. We were quite pleased with our stay. 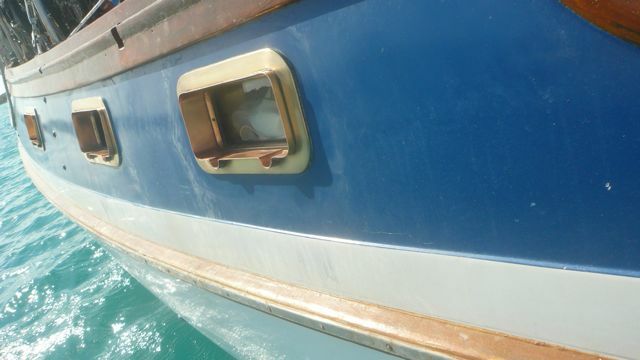 We took the time we had in a quiet marina to scrub down and polish up the back outer ports. We had them shined up and looking like brass once more. Compare these ports to the forward ones that still need scrubbed and polished (a photo of which is included in the gallery). We took off today for Rudder Cut Cay, but once we were there, decided that the anchorages did not have deep enough water at low tide for our 6 ft draft. So we moved down to Darby Cay instead. We found a narrow but deep inlet between Darby and Little Darby. In front of us is the Darby Cay Research Center, but no one appears to be home except a few chickens. The rooster was crowing earlier today. That should be fun in the morning! We took off exploring later in the day. Mike and Gary took the Moonshine dingy and Kris, Shane and I took ours. 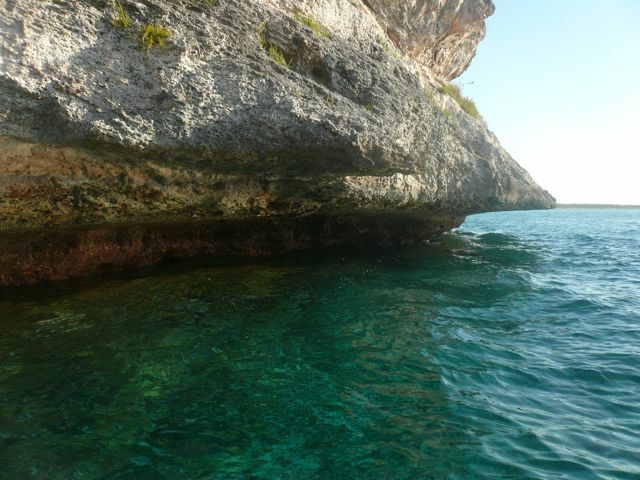 We explored a few nearby caves and tiny rock islands. Once such rock that I had named “cupcake rock” had an osprey nesting at the top. Shane decided to climb up through a hole we found in an outcropping. Kris terrorized us on the waves in the dingy. Shane was having a ball, holding the forward line and standing up like he was riding a bucking bronco. I was clinging for dear life. We made our way in on the other end of our inlet. 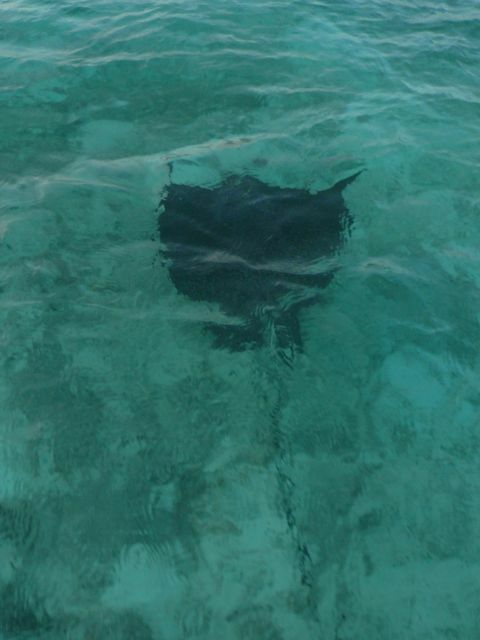 On the way we met a couple of big spotted eagle rays. We chased them about in the shallow waters. We pulled in as the sun was beginning to close in on the horizon, and prepared to head over to Moonshine for dinner. When coming back home to Horizons, later tonight, we looked up at the sky. It had been transformed into a deep black cave, glistening with millions of tiny quartz crystals and diamonds. When the moon is not yet up and you are far away from any large cities or towns, the sky explodes with stars! I wish I could take a photo of it for you all, but my camera does not quite have the capacity. Looks like you guys are having fun. Water is beautiful! Snowing back up here again, you are not missing much! I like the picture of the dogs on the dock! And the swimming pig! But I think there should be more pictures of Emily! 😉 Dad enjoyed the music video! Christopher wouldn’t want to trade weather with you today, because he had a Snow Day! Bowie says, “Bark! Bark! Bark!” Where is Pinkems?